Our client, Amy, was riding as a passenger in her own Jeep Liberty driven by her boyfriend in June 2014. 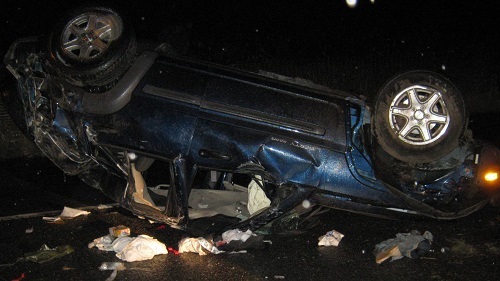 The couple was driving on northbound Interstate 405 in Kirkland shortly after midnight when a drunk driver in a Toyota Corolla drifted, struck construction barrels and then overcorrected into the Jeep's path. The violent collision flipped Amy's Jeep, causing major injuries to both her and her boyfriend. The Jeep's dashboard fell on her leg, and she had to be cut out of the vehicle by emergency responders. Amy was taken by ambulance to Overlake Hospital Medical Center in Bellevue. After losing consciousness at the scene, she was treated for scalp, forehead and facial lacerations, as well as multiple contusions at the hospital. The DUI driver, a 56-year-old Lynnwood man, drove three miles before crashing into a barrier. He was carrying a keg in his vehicle. He was arrested for DUI, hit-and-run and vehicular assault and was booked into King County Jail — he made $150,000 bail a few days after the accident. Amy, a 44-year-old flight attendant, contacted the serious injury and wrongful death attorneys at Davis Law Group, P.S., just three days after her serious accident. The significant crash caused Amy to suffer a hematoma in her right leg — a solid swelling of clotted blood within the tissues. The legal team at Davis Law Group wasted no time in fighting for Amy. The drunk driver that caused the accident was not carrying sufficient insurance to cover Amy's medical bills, lost wages and rehabilitation, so our staff pursued a claim with Amy's underinsured motorist coverage. We presented a reasonable demand for damages, and received a counter offer of just $10,000. The lowball offer spurned Davis Law Group's legal team to file a lawsuit. The strategy paid off for Amy. Through the process of written discovery, we proved multiple aspects of Amy's case. Dr. Bradley L. Remington, a plastic surgeon, was brought in as an expert in the case. Dr. Remington showed that Amy would benefit from scar revision surgery to improve the cosmetic appearance of the facial and scalp scars. Almost a year after filing suit, we went to mediation with the insurance company. We helped recover much-needed compensation for Amy and her family, including the $25,000 from the drunk driver's liability insurance, $10,400 in personal injury protection offset, and $80,000 in new money from the underinsured motorist claim, tallying nearly $120,000 for Amy. Davis Law Group recovered a settlement of $120,000 for Amy, who suffered a head and leg injuries in a collision with a drunk driver.